I think it would be the coolest job to work for America's Test Kitchen. I would know so much about food and the chemistry behind things. I had several episodes recorded and watched most of them today. (Yes, I had a very productive day). I learned that the secret to a chewy brownie is more unsaturated fat than saturated. I learned that the best cut of meat for stew is from the chuck and I learned that more than likely the brighter red your paprika is the better quality it is. I also re-watched the episode for these tostadas. I had watched it last week and planned to make them today, but I wanted to watch the episode one more time before I made these. I didn't even have to read the recipe instructions, because I just did what they did on T.V.! Chris (the host of the show) said that these tostadas are in the top 5 recipes they have ever done in eleven years of the show! They did turn out delicious and I will make them again and again. Next time, I will probably just eat the meat in a regular crunchy taco shell. I also think they would be good with some fresh, crisp lettuce. It has great flavor with a nice spiciness from the chili powder. 1. For the shredded pork: Trim the excess fat from the meat and cut into 1-inch pieces. Bring the pork, quartered onion, smashed garlic cloves, thyme, 1 tsp. salt and 6 cups of water to a simmer in a large saucepan over medium-high heat. Reduce the heat to medium-low, partially cover and cook until the pork is tender, 1 1/4 - 1 1/2 hours. Drain the pork, reserving 1 cup of cooking liquid. Discard the onion, garlic and thyme. Return the pork to the saucepan and using a potato masher, mash until shredded; set aside. 2. Heat the olive oil in a 12-inch nonstick skillet over medium-high heat until shimmering. Add the shredded pork, chopped onion and oregano; cook, stirring often, until the pork is well browned and crisp, 7-10 minutes. Add the minced garlic and cook until fragrant, about 30 seconds. 3. Stir in the tomato sauce, chipotle chili powder, reserved pork cooking liquid and bay leaves; simmer until almost all the liquid has evaporated, 5-7 minutes. Remove and discard the bay leaves and season with salt to taste. 4. 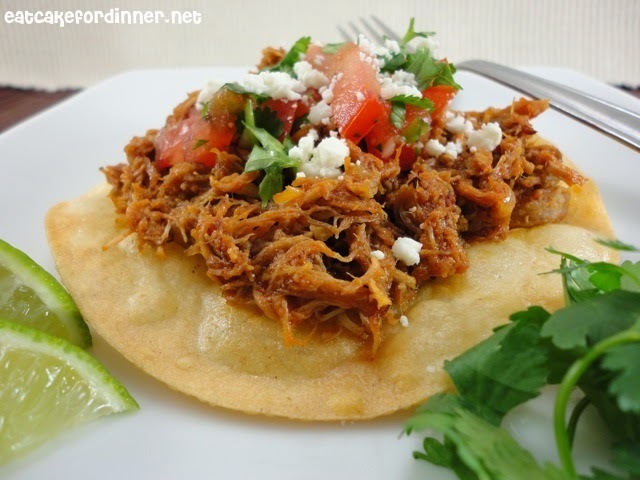 To fry the tostadas: Heat the vegetable oil in an 8-inch heavy-bottomed skillet over medium heat to 350 degrees. Using a fork, poke the center of each tortilla three or four times (to help prevent puffing). Fry, one at a time, holding a metal potato masher in the upright position on top of the tortilla to keep it submerged, until crisp and lightly browned, 45-60 seconds (no flipping necessary). Drain on a paper towel-lined plate and season with salt to taste. Repeat with remaining tortillas. 5. 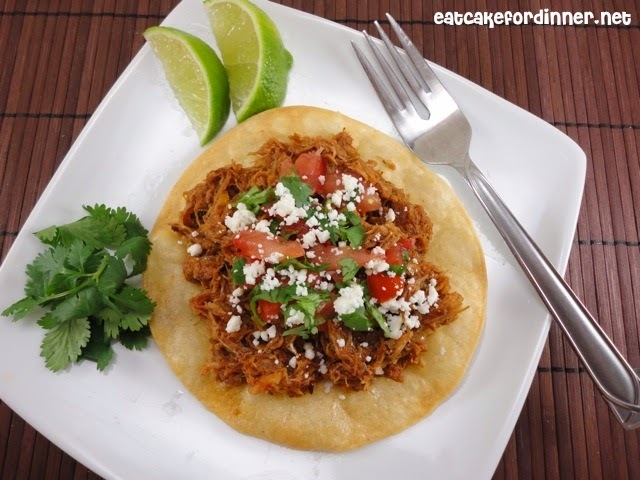 To serve: Spoon some shredded pork onto the center of each tostada and top with desired garnishes. Serves: 4-6 people. Jenn's Notes: I pretty much did exactly what the recipe says, except I only used about 1/2 of the chopped onion. You know the pork is done, when it shreds easily with only a fork. ATK says that if you can't find the chipotle chili powder to substitute two minced canned chipotle chiles. Yes that would be realy cool job:) I can think of few more..like being travelling food critic. I love tostadas...my Mom used to make them for us all the time. Thanks for sharing the recipe and a remider to make them. And yes, a job at America's Test Kitchen would be killer! I love America's Test Kitchen/Cook's Country and have been wanting to make these for a while. Good to know they are as delicious as they made them out to be!